Globally speaking, most people will think of “tsugaru-jamisen” when they hear the word shamisen. However, tsugaru-jamisen is one of the styles born in the Tsugaru District in Aomori prefecture. There are many shamisen styles and schools in Japan. Okinawan sanshin is also shamisen, it’s actually the ancestor of the shamisen of Mainland Japan. Although both Okinawan sanshin and Mainland shamisen have the same structure, they are very different in materials, playing methods, sound and tunes. 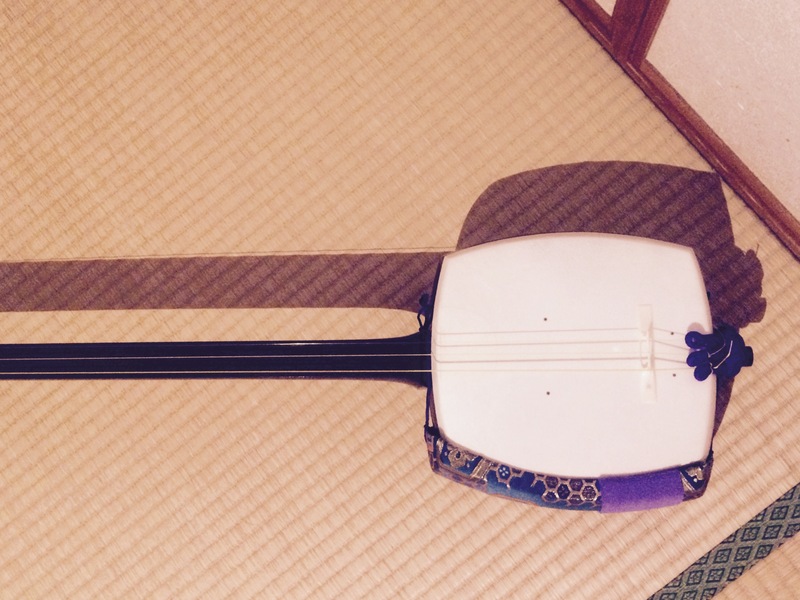 The original sanshin was brought from the south part of China during the Ryukyu dynasty. Sanshin is spread not only in Okinawa but also in Amami islands. Each community on each island has a different style of playing. My husband from Okinoerabu Island plays sanshin – acually it’s called “sanshiru” there – and just opened his website “Sanshiruko“. If you’re interested in it, please check it out! When I was 15 years old – the time to think about the future – I had two choices. To major in English at university or to enroll in a music collage. I’d been learning to play the electronic organ since when I was in kindergarten. I didn’t like anything besides English and music, and I didn’t have enough courage to get a job immediately after graduation from high school. So they are the only choices I could think of at that time. Finally I chose to study English and gave up going into music. There were two reasons. One was the advice from those who graduated from music schools. They said “if you have anything else besides music, you should follow that. If you concentrate on music, it will limit your potential.” Another reason was more convincing – lack of confidence in my musical ability. I knew some kids around my age who played like a genius at competitions. Gradually I came to avoid playing musical instruments, especially keyboard instruments after I decided not to pursue a career in music. It was strange. I loved music so much, but my passion seemed totally vanished. Time went by…and some years ago, my aunt suddenly gave me this shamisen, Japanese traditional musical instrument she bought about 30 years ago, saying “Now it’s yours. You should play it!” To be honest, I was not interested in it, but I heard a strong voice in my head “YES!” … And like Jim Carry’s “Yes Man”, accepting this beautiful instrument has brought a lot of things to me. Soon after, I found a shamisen teacher and started learning it. And I found myself enjoying the music from the bottom of my heart. Now I don’t have to be afraid of making mistakes. I don’t have to compete with others. I don’t really care what the others would think of my sound. I’m not bothered with the idea of ‘what comes next if I do or don’t practice it’… I simply feel happy when I play this instrument and enjoy playing with others. In addition, I came to get interested in Japanese cultures and history. I came to study the local cultures around here as well. And interestingly, I also came to play the piano. Perhaps I always wanted music but my old self didn’t allow it for a long time. I think I had a strong sense of inferiority about my musical ability. And I didn’t like my past self who couldn’t overcome it and quit music. Thanks to this shamisen – or my aunt who has watched over me for years? -, I gained a victory over my past self. To be more accurate, I accepted and reconciled with it. Now I’m even thankful to my past self who was seriously studying music because my experiences really help me learn Japanese music as well.